Activation of the immune response mediated by cells called microglia favors remyelination and myelin repair in multiple sclerosis (MS), according to a new Canadian study using mice. The research, “mCSF-Induced Microglial Activation Prevents Myelin Loss and Promotes Its Repair in a Mouse Model of Multiple Sclerosis,” was published in the journal Frontiers in Cellular Neuroscience. 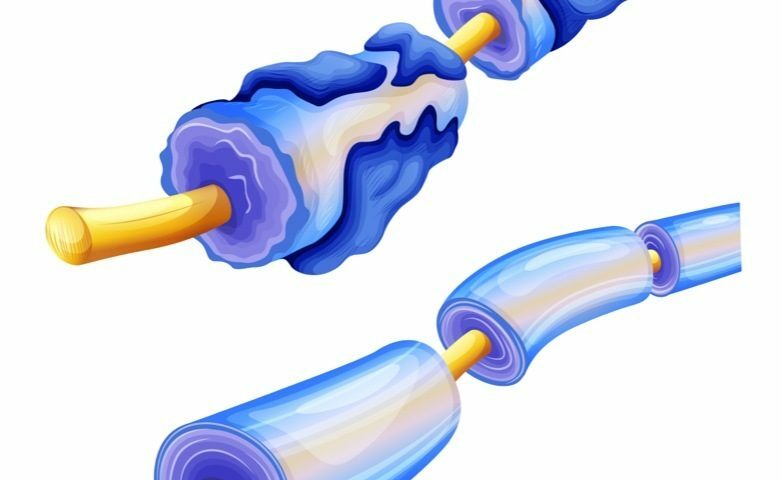 MS patients typically present progressive demyelination, or loss of myelin (the protective layer of nerve fibers), which leads to impaired nerve transmission. Although remyelination (the formation of new myelin) occurs spontaneously in MS lesions, it becomes increasingly incomplete and eventually fails. Among the factors involved in demyelination in these patients are the death of oligodendrocytes — cells producing myelin — and robust immune responses mediated by microglia, which are the resident immune cells of the central nervous system. However, an increasing number of studies suggest that microglia may be beneficial in disease progression by promoting regeneration, releasing growth factors and clearing myelin debris in a process called phagocytosis, which is key for remyelination. Animal models of MS include the well-characterized dietary administration of cuprizone, a copper-binding toxin, which enables the study of molecular mechanisms of demyelination/remyelination. Cuprizone causes death of oligodendrocytes and demyelination in brain areas such as the corpus callosum, which links the two sides of the brain. Replacement of cuprizone by normal food is followed by remyelination. Aiming to better understand the role of microglia in MS, scientists at Université Laval, in Canada, administered a molecule called macrophage colony-stimulating factor (mCSF) to mice receiving dietary cuprizone. mCSF promotes survival, proliferation and differentiation of cells involved in myelin damage and repair, while it also shifts microglia toward an anti-inflammatory profilefavoring remyelination. Prior research in a mouse model of Alzheimer’s showed that mCSF improves the clearance of the protein amyloid beta (which plays a key role in Alzheimer’s development) by increasing the activity of microglia, and therefore prevent or improve the cognitive decline associated with the disease. Now, researchers selectively deleted the mCSF receptor (CSF1R) in microglia to elucidate the effect of mCSF on both microglia and oligodendrocytes during demyelination induced by a five-week cuprizone diet. Results showed that mice given once-weekly mCSF had reduced myelin loss and elevated levels of microglia and oligodendrocyte precursor cells (OPCs) at lesion sites, which, according to the team, may be crucial for clearing myelin debris. Researchers also found that while mCSF given early during disease progression, or during the whole duration of the diet, significantly promoted remyelination, mCSF administered at the end of the cuprizone diet did not have beneficial effects. “These data indicate that mCSF should be administered in a very precise phase of MS progression, the initial phases, to exacerbate its protective and beneficial role,” the researchers wrote. In turn, removal of CSF1R in microglia led to exaggerated accumulation of myelin debris in the corpus callosum, as well as a reduced number of microglia and OPCs. “mCSF therefore plays a key role in stimulating myelin clearance by the brain innate immune cells, which is a prerequisite for proper remyelination and myelin repair processes,” the investigators wrote. Overall, the findings are in line with prior data indicating that the immune response may be beneficial for remyelination. “In this regard, mCSF may be a strong candidate,” the team noted. Given that current treatments are not able to prevent patients from entering the progressive phase of MS, “mCSF would be an ideal target for a clinical trial in individuals diagnosed with primary and secondary progressive MS,” the researchers suggested.